This client had a real problem: The management of their predecessor company had burned many customer bridges. 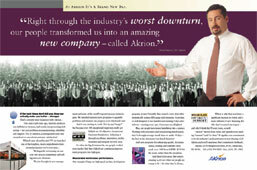 For the new Akrion we had to work fast to break with the past and rebuild credibility and respect. Heres how we accomplished that in one year.